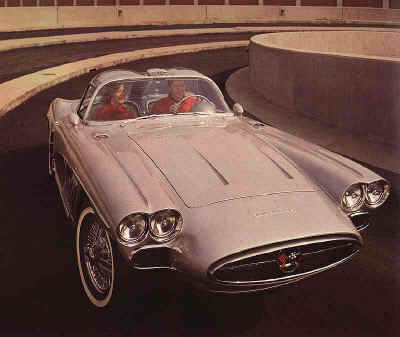 Designed and built in 1958 under the personal supervision of Bill Mitchell, the wild-looking XP-700 used many regular Corvette components, such as the frame, chassis parts and engine. The fiberglass body was extensively redesigned with a “grand prix” appearance. The long, low front overhang, large air scoops, exposed frontal areas and wire wheels with racing hubs were a few of the “grand prix” touches. The bubble-shaped laminated plastic canopy – coated with vaporized aluminum to help block the sun’s rays – was one of the most memorable features of the car. A metal strut in the center of the canopy featured louvered vents which enhanced circulation in the passenger compartment. Among the more exotic concepts: An overhead mirror, mounted above the windshield with a viewing porthole in the roof structure. The rear end styling influenced the second generation Corvettes.